So, here I am. Riding the Amtrak 158 train, coming home after a long business trip. It’s hot. The AC is barely working. A baby is screaming right next to me while the accompanying mother looks forlornly out the window, clearly questioning whether or not having a child was the right life decision. And to top it all off, the Wi-Fi doesn’t work. Luckily, I brought along my Game Boy and collection of Pokemon games. As I slid my trusty Blue version into my Game Boy, I thought to myself, instead of battling Gary Oak for the thousandth time, maybe I can do a little computer vision. 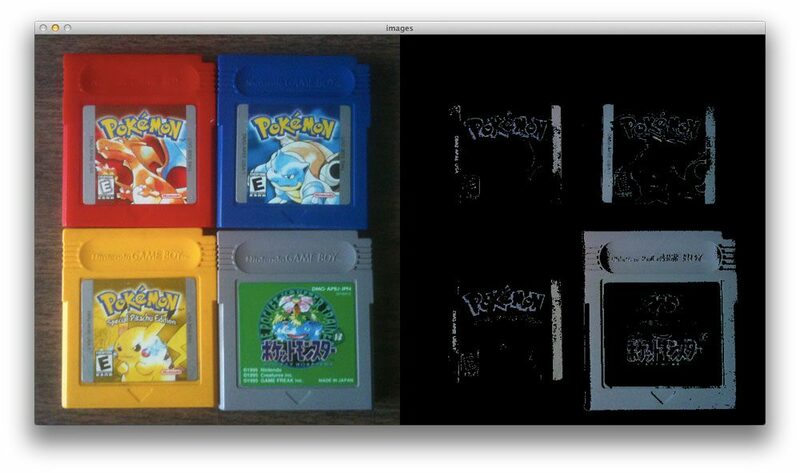 Honestly, wouldn’t it be really cool to be able to segment each of the game cartridges using nothing but color? Grab yourself a nice cool glass of water to combat the failed AC and a pair of ear plugs to block out the wailing child. Because in this post I’ll show you how to use OpenCV and Python to perform color detection. Let’s go ahead and get this started. We’ll start by importing our necessary packages on Lines 2-4. We’ll use NumPy for numerical processing, argparse to parse our command line arguments, and cv2 for our OpenCV bindings. Lines 7-9 then handle parsing our command line arguments. We’ll need just a single switch, --image , which is the path to where our image resides on disk. Then, on Line 12, we load our image off disk. 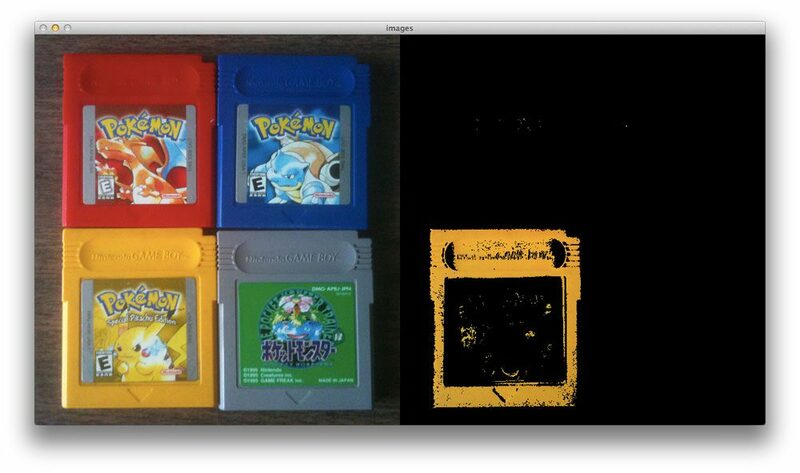 We want to be able to detect each of the Game Boy cartridges in the image. That means we’ll have to recognize red, blue, yellow, and gray colors in the image. All we are doing here is defining a list of boundaries in the RGB color space (or rather, BGR, since OpenCV represents images as NumPy arrays in reverse order), where each entry in the list is a tuple with two values: a list of lower limits and a list of upper limits. For example, let’s take a look at the tuple ([17, 15, 100], [50, 56, 200]) . Here, we are saying that all pixels in our image that have a R >= 100, B >= 15, and G >= 17 along with R <= 200, B <= 56, and G <= 50 will be considered red. Now that we have our list of boundaries, we can use the cv2.inRange function to perform the actual color detection. We start looping over our upper and lower boundaries on Line 23, then convert the upper and lower limits to NumPy arrays on Line 25 and 26. These two lines seem like they can be omitted, but when you are working with OpenCV Python bindings, OpenCV expects these limits to be NumPy arrays. Furthermore, since these are pixel values that fall within the range [0, 256] we can use the unsigned 8-bit integer data type. To perform the actual color detection using OpenCV, take a look at Line 29 where we use the cv2.inRange function. The cv2.inRange function expects three arguments: the first is the image were we are going to perform color detection, the second is the lower limit of the color you want to detect, and the third argument is the upper limit of the color you want to detect. After calling cv2.inRange, a binary mask is returned, where white pixels (255) represent pixels that fall into the upper and lower limit range and black pixels (0) do not. Note: We are performing color detection in the RGB color space. But you can easily do this in the HSV or L*a*b* color space as well. You would simply need to adjust your upper and lower limits to the respective color space. To create the output image, we apply our mask on Line 31. This line simply makes a call to cv2.bitwise_and, showing only pixels in the image that have a corresponding white (255) value in the mask. Finally, our output images are displayed on Lines 34 and 35. Not bad. Only 35 lines of code, and the vast majority is imports, argument parsing, and comments. Figure 1: Detecting the color red in an image using OpenCV and Python. 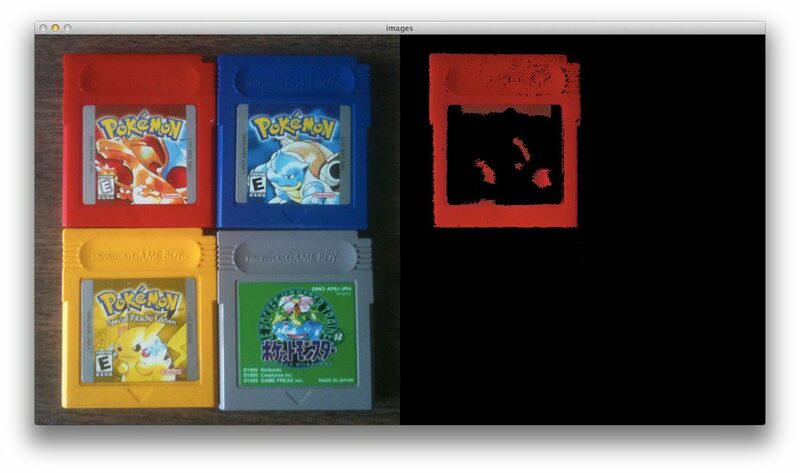 As you can see, the Red Pokemon cartridge is easily detected! Figure 2: Detecting the color blue in an image using OpenCV and Python. Figure 3: Detecting the color yellow in an image using OpenCV and Python. Figure 4: Detecting gray in an image using OpenCV and Python. In this blog post I showed you how to perform color detection using OpenCV and Python. To detect colors in images, the first thing you need to do is define the upper and lower limits for your pixel values. Once you have defined your upper and lower limits, you then make a call to the cv2.inRange method which returns a mask, specifying which pixels fall into your specified upper and lower range. Finally, now that you have the mask, you can apply it to your image using the cv2.bitwise_and function. My train is just a few stops away from home, so I better wrap this post up. I hope you found it useful! And if you have any questions, as always, feel free to leave a comment or shoot me a message. thanks adrian! will try this out soon! Hi Sultan — you might not have specified a proper path to your input image file. Try specifying the right path and let me know if it works. Hey Dewald — can you clarify what you mean by “alternate method”? Can you tell me where exactly do we have to specify the path to the image? How much is this efficient to segment pictures according to their colors with other famous existing segmentation algorithms ? The cv2.inRange function is extremely efficient, but has the caveat that you need to know the pixel intensity boundaries prior to applying it to the image. Methods such as Otsu’s thresholding and Adaptive thresholding can be used to help determine the threshold value in traditional thresholding. We are trying to find the ratio of red and green glowing armbands from a video stream captured by a RasPi. The images of an outdoor square where the lighting conditions will be changing through an evening. Can you suggest a good method for picking out the red and green bands? I’ve been playing with your sample code and I’m a bit stuck figuring out the ranges. I am clearly not defining them properly as the masked images come out barely showing the red and green. Ultimately the output needs to be the ratio of green:red to crowd-control a pong like game. Thanks for the great sample code and any advice you can offer. I think this post on ball tracking will really help with your arm band project. Inside that post I make reference to a range-detector script inside the imutils package that will help you determine the appropriate color ranges for tracking. where is it??? I want range-detector for perticulat area not for perticular pixel. You can find it on the imutils GitHub. Actually I want to know the lower limit and upper limit of any color from the live webcam. I want to know minimum and maximum hsv value from selected portion(using mouser cursor with click) from the image. Hey Ankit — please see my previous reply. You need to use the range-detector script to determine your upper and lower limits. It’s hard to define thresholds that will always work, mainly because colors may have different HSV values depending on the lighting conditions of your environment. Last question, if I may: do you think that segmenting an image according to its colors is a good idea to use in order to recolor the image with given desired colors for each segment ? Could this give a good result ? Great question! The answer is yes, absolutely. This post on color transfer between images could be dramatically improved by performing the local color transfer within each individual segment rather than globally. The caveat is that you’ll have to “match” which segments are the most similar for the source and target image. Great work. I’ve seen several implementations but yours is the most elegant I encountered so far. One thing though, if you wanted just to get a boolean flag like blue_is_present or orange_is_present would you find some way yo compare the current array with the previous ones or go with object tracking instead? If you wanted to have a boolean flag indicating whether or not a color is present, I would loop over the color ranges, generate a mask for each one, and then count the number of non-zero pixels in the mask using cv2.countNonZero. If the number if non-zero pixels is above a given threshold, then you could say that a given color is present. I hope that helps! I am trying to learn color detection through this guide, but i can’t understand how did you determine the boundaries, can you point me out a good reference for this one? Thanks. Basically, I end up opening the image in Photoshop (or a similar program) and examining the pixel intensity range. Any simple image editing software can help you out with that one! Actually I’m using ColorPix.exe to determine the RGB value of the color, but I don’t understand how can I set the boundaries. this is a shade of RED i want to reference with, and i want to make a range (lower and upper), now I’m stuck i don’t know how to determine the lower or upper. I tried subtracting 20 to RGB for the lower, and add 20 to upper, but it doesn’t detect the color. If you are trying to define “shades” of a color, it’s actually a lot easier to use the HSV color space. I would define your colors in HSV using your color picker tool, and then convert those colors back to RGB. Hello Adrian . When trying to complete this exercise appears to me the following error: mask = cv2.inRange (image , lower, upper ) error : (209 ) the lower bounary is neither an array of the same size and same type the src , not in scalar function cv :: inRange … I’ve given round and round but still with the same error . Hi Franciso, I have actually heard about this error from one or two other PyImageSearch readers as well. The code executes without a hitch on my machine and the PyImageSearch virtual machine. The first thing I would do is make sure the path to your image is correct. You supply the image path via command line argument. If after ensuring that your path is correct, can you let me know which version of Python, OpenCV, and NumPy you are using? And it would probably help to know which OS you are using as well. On my Ubuntu virtual env I compile without any problem too, but when I port over to the RasPi3, I get this same error as above? Do you know what could be causing this? The image is in the working directory, so I doubt it’s a path issue? Also I’ve tried running in Python3, with no success but all else in the RasPi virtualEnv is compiling in Python 2.7.9, so I guess I’m forced to go with Python 2 for now. Will see if I can find out what the issue with Python 3 is??? Hi Tony — I still think this is a path issue. Try hardcoding the path to the image into cv2.imread to verify this. I would definitely try to execute the script via command line instead of IDLE and see if you still get the error. Like I said, the problem could potentially be that the image is not being read of disk properly. Inspect the returned value of cv2.imread and if the value is None, then you’ll know that the image was not read properly. As for the versions of OpenCV and NumPy, it would be really beneficial if you could give the exact version numbers rather than just “recent”. Hey Francisco, the PyImageSearch Gurus is set to open to the public in August, which is still months away. In the meantime, I definitely recommend that you pick up a copy of Practical Python and OpenCV so you can start to become familiar with OpenCV + Python. It’s definitely the best way to learn computer vision! Thanks for the clarification Nick! If you’re only using a black and white image, I would suggest using the cv2.threshold function instead. Does it work for video stream as well? video stream off Pi camera? Absolutely. Take a look at this post on accessing the Raspberry Pi camera using OpenCV. I want use pi camera,How can i use it color detection and different image processing? Hey Mobin — if you want to use the Raspberry Pi camera, I would suggest reading this post on accessing the Raspberry Pi camera. It will only take a few small modifications to this code to take an input image from the Raspberry Pi. First of all, great work on the blog and the tutorials, I really appreciate your work. This has already helped me a lot with what I am trying to achieve 🙂 Marc already wanted to know, whether there is a way of determining the boundaries from a given colour. In my application, I take a photo of lego bricks with a raspberry pi and want to determine the bricks’ positions inside a grid and what colour they are. I know which brick colours there are in the image, but I have to account for bad lighting (or at least differing lighting conditions). Do you think I could get satisfactory results using the shown approach by first automatically adjusting contrast/lighting and then calculating the boundaries in hsv with some fixed value? Hey Iris, in general I think you are on the right track. But I would strongly encouraging you to work with your lighting conditions prior to writing a single line of code. The success of most computer vision applications starts before a single line of code is written — it all starts with the quality of your images. The higher quality they are, the easier they are to work with. is it possible to use this through a video? It certainly is! You’ll need to make use of the cv2.VideoCapture function to obtain access to the webcam. I actually detail exactly how to perform color based object tracking inside Practical Python and OpenCV + Case Studies. Definitely take a look! thank you Adrian. this will be very helpful. can i ask, if you have another one example for shape detection, like arrows or any other shapes?? i just think, that i might easily understand youre example. than the others in the internet. If you’re interested in doing other types of shape detection, contours are always a good start. I use contours to recognize square targets in image — the same methodology can be used to identify other shapes. Otherwise, you might be interested in shape descriptors such as Hu Moments or Zernike Moments. Thanks for the amazing tutorials !!! I just have a small question. What would be the tuple value for green color? in order to only detect green color from an image. Pure green in the RGB color space is (0, 255, 0). However, you’ll need to play with these values a bit to make them detect the particular shade of green you are interested. An alternative is to use the HSV color space where you may find it easier to define the color ranges. Once again Adrian you grabbed my attention. Now its time to buy the book today. Please keep up the good work, and give us more. What system are you running the code on? And what is the size of each frame you are processing? Hi Adrian, thanks for the great code! How do I detect two of the colors at the same time? All you need to do now is maintain a mask from the output of Line 30. Keep updating the mask for each color, and then when you run out color boundaries, you’ll have your final solution! Hey, Adrian. Good blog! The fact that I will be able to learn for free through your blog is just exceptional! You are my inspiration! I want to ask something. I want to track two objects in a video. The two objects can change colours between green and orange (those two colours only). Example, if Object1 is green, there will be print out ‘Object1 = On” and at the same time if Object2 is orange, there will be print out ‘Object2 = Off’. I am thinking of a way of doing this that is by slicing parts of the frame into two to focus on those two things differently and applying the cv2.range to both of the sliced frame. If the cv2.range detect green it will returns mask (means there is white pixels inside the sliced frame), so, from that the program will know if the object is green or orange. But how can I tell the program to check if the returns contain mask or not? Or do you have any other better workaround? Just read your post about tracking object movement. I think I can use the function if len(cnts) > 0 to detect if there is any white pixels in the mask. Is it possible? Or you have anymore efficient way? It sounds like you’re on the right track. I would use this post as a starting point, and then modify it so you can track both colors. Thanks for this tutorial. Similar to a few other users here, I am also getting the following error: “The lower bounary is neither an array of the same size and same type as src, nor a scalar”. I am using python 2.7.10 and what I believe is OpenCV 2.4.11-7 on Windows through Python(x,y) Idle. Is my set up ok for running this code? I like Python(x,y) because of all the modules it comes with in one quick install. I have been troubleshooting for a while but I can’t figure out what is wrong. I really just want to segment an image by color – do you know of any other simple methods to do this? Thank you – love the site. Your Windows + OpenCV installation should be fine. As for your error message, can you double check that the image was loaded properly from disk using cv2.imread? And image is None, then you’ll know that your image was not loaded from disk properly and is causing the error. EDIT: I have been able to replicate the error on my machine. The error is indeed due to a valid image path not being supplied to the cv2.imread function. Hey Adrian, thank you for checking this out for me. Indeed you are correct and I am receiving NONE when I try to print the image with opencv commands. After troubleshooting the imread command for a bit, I tried loading the image with scipy instead then continuing the work with cv2 and this works! From a bit of internet browsing, it seems like others who had this problem fixed it by working around it like I did or updating to a newer version of openCV. Thanks for the help. I don’t know why \\ this worked. If someone knows then please explain me. Both OSX and Linux systems use “/” as the path separator. However, Windows uses the “\” path separator. But in most programming languages you need to “escape” the “\” character, leading to “\\”. Hi Adrian, i want to detect the colours using webcam what changes i have to do in above code. I would suggest starting by giving this post a read. Works great!!! But if i want to separate the image into regions of different colors without knowing what colors will be in the image beforehand, how do I do it? For example, if I have an image that contains just three colors(I don’t know what they are), and want to draw contour around the images how do I do it? Thanks a lot!!! PS. I saw your other post on labeling different colors in an image but will that work if some of the colored region is inside other region? You’ll need to segment out each color individually and then label it. I would suggest starting with this post on color quantization with k-means to help segment out the colors. Hello Adrian, how can i show the original and result images on two different windows ? This works brilliantly! How would I modify the code so it takes multiple images instead of one, and processes them all with one execution of the script? The only piece of code that needs to change is to apply a “loop” that loops over an input set of images. Take a look at how I apply the list_images function in this blog post and it will give you a good idea on how to process multiple images. i want to detect a Picture of apps on my Smartphone Screen: exactly I have a Webcam and i have to detect apps on my Smartphone Screen und recognize where they are. And i want to define the Coordinate of this . There are multiple ways to do this, but I would likely start with multi-scale template matching. i am copy and paste your program in my desk sir , and then i get an eror , can you help me resolve this ? Please see my reply to “Francisco” above. The error is 99% likely due to the path passed to cv2.imread being invalid. If you are absolutely, 100% sure that your path to the image is valid, then OpenCV likely cannot read the image type you are trying to pass in. Again, I’m pretty sure that your image paths are incorrect. But if they are, try placing a print(image) call right after cv2.imread. If you get None back AND your image path is valid, then OpenCV cannot read your image type. Hi Adrian, thanks for this amazing tutorial! any other tools or tips you can give? Have you tried simple thresholding and adaptive thresholding? What about edge detection? Yes, both simple and adaptive wasn’t good enough to get tesseract to read the text, I was trying SWT but no luck there too. Still looking for the right way to make it easier for OCR to read it. SWT is a great algorithm, although I’m unaware of a good Python implementation. Which version were you using? Also, I still think simple thresholding can be used one. The first threshold can be used to detect light text against dark backgrounds. And a second round of thresholding can be used to detect dark text against light backgrounds. Furthermore, since this is a scoreboard, you “know” where in the ROI the text will be, allowing you to focus on the regions of the image that are most likely to contain text. How can I know the result of the colour is detected without looking at the image window? Is there any programmable API from cv2 to return a boolean to tell me blue is detected ? Assuming that mask contains your detected blue pixels. I hope that helps! As you have correctly pointed out already it is a path issue to the image. I can run the code in terminal and it runs perfectly. The question I have is this, can I add a line of code that defines specifically the path so that I can run and then edit the code in my IDE? Thanks for your time!! Are you executing your Python script from within your IDE? Or via command line argument? If you’re using an IDE, I normally recommend using the IDE to write the code — but then use the terminal to execute the code so you have better control over the command line arguments. Defining the valid color ranges can be pretty tricky, especially if you’re just getting started. I would start by using the range-detector script in the imutils package. This will help you tune the ranges. Is there any way to set white color for background instead of black ? Can you elaborate on what you are trying to accomplish? Are you referring to the final output mask? Are you busy hunting Pokemons nowdays Adrian? Hello, Adrian nice Work i am working on plant Detection project so please Can you Tell me what is i want to detect Green Colour from my USB camera. Please see my reply to “Txoof” above. Thanks for the tutorial. I used it to detect stationary green objects in a game where player can hide. That sounds like a perfect use-case for the cv2.inRange function. Have you tried defining the lower and upper boundaries for your green objects yet? I would suggest using the range-detector script mentioned in this blog post as a starting point. Excellent tutorial Adrian, Thank you!! But I have a question, what method you are using to define HSV color ranges, it is very hard to adjust the ranges to different images. Take a look at my reply to “Txoof” above. I would want to extract black color, range from ( 0 to 50) from the pic (honeybee colony). To define your own custom color range, just define the lower and upper boundary boundaries. You can do this by modifying the boundaries variable. It might take some trial and error to get exactly right. Great! Worked well, able to detect black pixels. I thank you.Can you say how to change black background to white one. Sure, all you need is masking. Create a new image with the same dimensions as the original one, only with a white rather than black background. Then apply bitwise masking to make the foreground show up on the background. I provide more information on masking and bitwise operations inside Practical Python and OpenCV. Normally, we refer to pixel values in RGB order. However, OpenCV refers to them in BGR order (NOT GBR order). Therefore, the pixel values supplied in this blog post are provided in BGR order, which is what OpenCV expects. hey adrian, ineed your help, i want to combine your work about the color detection and shape detection, adding the position of the object, and the result in show in the terminal, i already success but the color and shape detection didn’t combine in the result output, can you help me? I would suggest following this tutorial where I demonstrate how to track the position of the object. i need to know the boundary values for green color . I would suggest using the range-detector script I mentioned in the blog post. The boundaries for each color can vary dramatically based on your lighting conditions. Hi Adrian.! can we able to detect some multiple colour combination i.e Military Camuflague colour with this thing .? what are the settings we are going to play with ,? You would want to define color threshold ranges for each color in the camouflage. Then, apply each of these thresholds to the image and construct a mask and combine the masks for each range. This will help you detect camouflage in your image. The image + source code are included in the “Downloads” section of this blog post above. Thanks but i have errors in lines 8 _ 9 .. in reading the image .. could u give me an example to correct arguments? Hello Adrian, how can i setting resize the result images and save it to new image jpg format ? To write an image to disk you would see cv2.imwrite. If you’re just getting started with learning computer vision and OpenCV, I would suggest that you go through Practical Python and OpenCV. Your question is addressed in the first few chapters. sorry to say that i dont know how to get the correct path in line 8~9…..should i replace –image with my pictures’path? No, you simply need to supply the --image switch as as command line argument when you execute your Python script. Please see this tutorial for more information. Hey Adrian, i would like to use this to concept to build an app to help people with color vision deficiency (usually known as color blindness). I wanna detect whether in an image there is blue, red, green color, or any of its combination to help those who have partial color blindness. 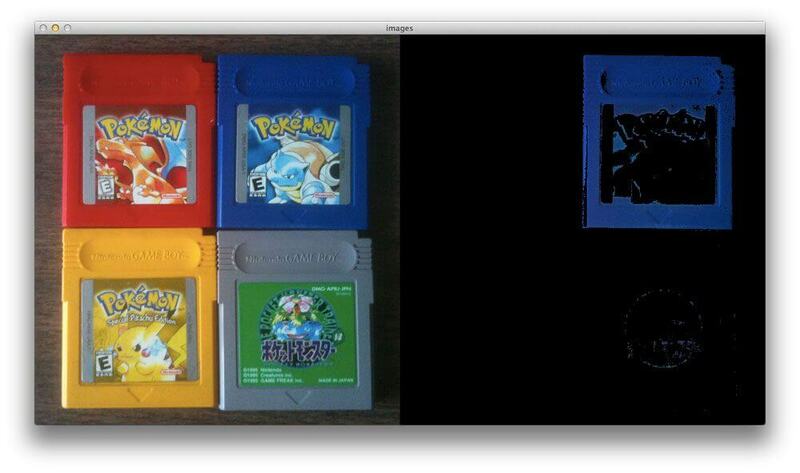 but i also need to detect any colors in an image for those who have total color blindness. Could you help me about this? what should i do to make it works? In order to perform this type of color balancing you would first need to calibrate your images using a color chart or a gray-level balancing card. From there you can obtain a consistent level of color representation for a given scene with your camera. This is definitely more of an advanced technique and not one I would recommend you taking on if you are just getting started with OpenCV and computer vision. If you’re just getting started in the world of computer vision and OpenCV, I would suggest you work through Practical Python and OpenCV before continuing. Thanks for ur kind reply, but i haven’t set my goal far to do color balancing, i just meant to ask what should i do to detect all colors within an image without setting any boundaries of RGB color space? Just like the code u share, but without setting any boundaries, could u please give me the answer? Are you looking to detect and label various colors in an image without setting any color boundaries and without color balancing? Simply put, that’s not possible, unless you train a classifier to label the colors of pixels based on real-world images. Hi, your code looks interesting. I am working on a project in which I have to perform color change, not just color detection. As in, if I detect yellow, I have to display an image with white overlapped on the yellow blobs. Any suggestion on how I could do that? You could use OpenCV’s cv2.drawContours function to draw the white overtop the detected yellow blobs. I discuss the basics of OpenCV and how to use cv2.drawContours inside my book, Practical Python and OpenCV — I would highly suggest starting there. Hey Amir — it sounds like your input image was not properly read from disk. Double-check your command line arguments. If I have to determine the color of a cloth. I have to manually specify all the color ranges and the corresponding color or there is some other way. It depends. Normally you define a set of colors that you want to recognize and then quantize the colors in the image to their closest corresponding color in your database. I would look into k-means color clustering as well. Hi Hadopan — please see my reply to “Txoof” above where I mention the “range-detector” script in the “imutils” package. I’ll be doing a detailed blog post on this subject in the future. Also is there any other way to fix the light condition problem when doing color detection? You’ll want to modify the range-detector script to print the values. I would suggest after a specific key is pressed on the keyboard. I’ll be doing a tutorial on a more user friendly, easier to use range-detector script within the next couple of weeks. Dear Adrian, I am working on tracking the color balls in snooker game.I can Track the objects but how can I append the numbers to the identified color ball as per the corresponding colors Like 1 for yellow , 2 for blue 3 for green 4 for red etc,. Working on python opencv platform. I think that your tutorial is great but Ι faced an error when runing the code. cv2.error: C:\projects\opencv-python\opencv\modules\core\src\arithm.cpp:1947: error: (-209) The lower bounary is neither an array of the same size and same type as src, nor a scalar in function cv::inRange. What should I do? Congrats on resolving the issue, George! Be sure to double-check your input image paths! The cv2.imread function WILL NOT throw an error if you specify an input image path that does not exist. Instead, the function will return None. i face the same problem.and i also give the image extension but the same error are show. Be sure to check the path to your image. Specify the directory and image filename. I have been changing the shades of red to make it the shade of red I want. I have been trying and it hasn’t returned anything. My red is a bit lighter than the one in your article, but when I use your BGR values for red, only the dark side is masked. Any ideas? Try using a different color space such as HSV or L*a*b*. These color spaces tend to be a bit more robust for detecting shades of color. i have a project for color detection, i need an explanation about the advantages of HSV from RGB. can you explain to me? HSV tends to be more natural, similar to how humans perceive color. It’s easier to define color ranges in the HSV color space. The Wikipedia article actually does a very good job explaining the benefits. Thanks for the useful tutorial. I was wondering, is there an easy way to get box coordinates for the detected colors? Compute the bounding box via cv2.boundingRect. Take a look at this blog post for an example of using it. Hi Adrian, I would like to ask if there is any way to combine two mask into one? Which means to say, i want blue and green color to appear on the same window. Appreciate your help! Sure. Just use the cv2.bitwise_or function on the two masks. Hi Adrian, i am facing an issue whereby the mask detects colors that i do not need. Is there anyway where i can eliminate these unwanted colors? I would suggest using a color space more suited for color range detection (and slightly easier to fine-tune) such as HSV or L*a*b*. I would start with the HSV color space. I would like to know how did you come up with the upper and lower boundaries of the red, blue, green and yellow in the example above? Also, do you have any suggestions to what I am trying to do? 1. Try using a different color space such as HSV or L*a*b*. I would recommend HSV. 2. The range-detector script inside the imutils library can be used to detect color boundaries. I’ll also be releasing a new version of the script soon, so be on the look out! How do you use the range-detector script inside the imutils library? Do you have to make adjustments to the code or just run it straight? I tried running it straightaway, but it ask me to specify an argument. Thank you for the wonderful blog. It really helps. Instead of displaying four outputs I just want one out whenever the color in the image is found just stop. For eg. I have 5 different upper and lower boundaries but there is only one (say blue) color in the image, so I need only one output with blue image,what changes do I need to make ? Hey Falun — assuming I understand your question, it sounds like you need to loop over each of your color ranges, one-by-one and then compute the mask. Call cv2.countNonZero on the mask to see if there are any masked pixels. And if so, break from your loop. I hope that helps! One last question from me. I am trying to display multiple colors in the result. I am trying to append the mask and result value to a numpy array if the countNonZer0 > 0 but I am not able to display the mask and result as the values are not getting append correctly. Can you help me with how should I output multiple colors ? How can I find the most dominant color in the image ? If its a sky it should be blue. What mathematical operation do you use and how many types of methods are there for color detection, you know? Thanks for your tutorials which are really helpful. I am quite interested in how the range-detector works. Have you post any code explaintion in detail for the range-detector ? Waiting for your reply. Thank you so much. I have not created a dedicated post for range_detector — I’ve been busy with other tutorials. I’ll be writing range_detector to make it easier to use as well. 1.When I run the script on command prompt a window is popped saying that python has stopped working. Any idea? 2. Is there any other way I can read image without having to use command prompt. I am using jupyter notebook. 1. I’m not sure about that. What is the exact error message you are getting? 2. Sure, you can load the code into Jupyter, remove the command line arguments, and hardcode the image paths. Double-check the command line argument paths to your input file. It seems like the path to the input image is invalid and cv2.imread is returning “None”. It sounds like you may need to tune the color threshold parameters. Try tuning them to whatever color object you are using for detection. hi, is it possible to create real time video with color detection like this sample program? Yes. Take a look at this post. hey adrian, do you have a post where you detect an object based on a certain color and then drawing a bounding box over it. maybe some additional lines to this code itself? Hi Adrian, how can I display on the same mask more colors if it is in a for loop? Do you want one mask per color? Or a single mask that combines the masks from all colors? You should double-check your mask output. Even there is even a single pixel your conditional will return “True”. You may want to increase the pixel count from 0 to 10 or 100 to handle the event there is some noise in your image. Thank you for all of your posts. I am trying to identify different faces (Bottom / Side) of a “triangular prism” die (NO DOTS on the surface) out of a top-view color image. What will you recommend if I want to count different sides of the die in the image? Should I go for color recognition or shape recognition or both? Do you have any example images of what you’re working with? I think seeing a visual representation of the images you are working with and what you are trying to accomplish would be helpful in understanding this problem. Exactly which color space you use depends on your project. HSV tends to be a bit easier, more intuitive (once you understand the basics), and provides better results once you have the threshold defined properly. IF you are getting two black windows then no pixels are falling into your defined range. You will need to further tune the color thresholds. Thanks a lot for your tutorial. I am trying to do something similar except that I am trying to detect all of the contours in the picture that are not of green colour and draw squares around them. I have looked at your different tutorials like motion detection, shapes detection..etc. However I can’t manage to find the right openCV command that includes all of the colours but the range I don’t want. I am trying to find the “out of range” equivalent. What command do you reckon I use? If it helps I am trying to use this to get detect target in a green environment like in a forest or so. Double-check your path to the “cv2.imread” function. Your path is invalid causing “cv2.imread” to return “None”. You can learn more about NoneType errors, including how to solve them, in this post. How I solve the problem “the following arguments are required: -i/–image”? You can solve the error by reading up on command line arguments. Great post. I have a simple question. I have a list of colours that I need to detect in an image. Could you tell me how to get boundary/range of any colour I want (say purple)? You would need to manually specify those color threshold parameters. The range-detector script in the “imutils” library may help you out. Hi, how did you get the RGB boundaries for your colors? I used the range-detector script from the imutils library. Hi Adrian, how exactly did you use your Range Detector script to determine your color ranges? I’m having trouble working with it. You load up an image (or video) in the script and then adjust the sliders. You’ll want to use the sliders to determine your color range. From there you record the RGB or HSV values for the range and use them in your own script. I just want to ask you if there is any code for color detection using opencv and pi camera ? No, but you can use this tutorial to access your Raspberry Pi camera module and from there use the code here to detect colors in a video stream. I hope that helps! I would recommend you use my VideoStream class. You can use the “Downloads” section of this tutorial to download the source code and example dataset. How you are deciding the values of red,green,blue colors? I am using the range-detector script in the imutils library. I have a question, is there a way to inverse the output? like, display everything EXCEPT what is in the upper lower boundries? So suppose instead of displaying only red Pokemon, it displays everything except the red Pokemon. What I am getting is somewhat what I want but not exactly. So I am getting point number one, and the color blue is not being displayed which is what I want, but it is being filled with a yellowish color, instead I want it to be colored in black. Hi Adrian. massive work here thanks. I’m a beginner in Python and I’d like to find a way to detect colors in certain areas of an image. I can’t seem to find an easy way to deal it with. what’d you suggest. thank you. hey Adrian what are uses of this color detection?Can we display the name of the detected color also? if so can you please help me at least giving a reference link .thank you. Yes, refer to this tutorial. What is math behind inRange? It’s simply a threshold test. If you’re new to thresholding I would recommend you read through Practical Python and OpenCV — that book will teach you the basics.